WOKING’S New Victoria Theatre is one of just six regional venues to host a visit by the legendary Glyndebourne Tour this autumn. 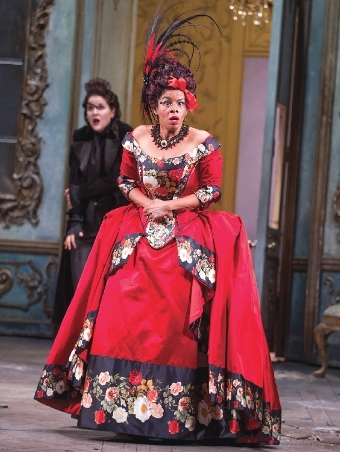 Opera lovers can sample a week of performances from Tuesday (October 28) until Saturday, November 1 when Glyndebourne will present three productions – Mozart’s La Finta Giadiniera, Verdi’s La Traviata and Britten’s The Turn of the Screw. Glyndebourne Tour are celebrating 20 years at Woking this year. First performing at the New Victoria Theatre back in 1994, they have returned every year since. This year, La Finta Giardiniera will be directed by Frederic Wake-Walker and conducted by former Glyndebourne Chorus Master Christopher Moulds. It features award-winning Italian soprano Rosa Feola making her Glyndebourne debut as Sandrina, Tour favourite Eliana Pretorian as Serpetta, and Polish mezzo-soprano Hanna Hipp, a graduate of the Royal Opera House’s Jett Parker Young Artists programme, as Ramiro. Sung in Italian with English supertitles, La Finta Giardiniera will be performed on Tuesday, October 28 and Friday, October 31. La Traviata will feature young conductor David Afkham, fresh from conducting in the Glyndebourne Festival, and American tenor Zach Borichevsky, making his UK debut singing Alfredo Germont alongside Russian soprano Irina Dubrovskaya, who is singing at Glyndebourne for the first time. Lauren Easton, who made her Tour debut in 2012, will return to sing the role of Flora Bervoix. La Traviata will be performed on Wednesday, October 29, and Saturday, November 1, sung in Italian with English supertitles. The Turn of the Screw will feature Welsh soprano Natalya Romaniw in the role of the Governess and former Jerwood Young Artist Anthony Gregory as Peter Quint. Also making her Tour debut will be 13-year-old Louise Moseley in the role of Flora. The Turn of the Screw will be performed on Thursday, October 30, and will be sung in English, with supertitles.